The VELG Training 2018 National VET Conference was held at the Adelaide Convention Centre (ACC) this month. Spanning over two days, the conference theme for this year was ‘Skilling Australia’s VET Future’ and involved conversations about the VET industry and the future of education. Senator the Hon Michaelia Cash’s keynote speech provided insights into the importance of the VET sector in Australia and to small business owners (97% of whom have a VET qualification as their highest level of education). She also linked VET to Australia’s five key industries for growth in the next three decades (these industries include advanced manufacturing). Click here to view the Minister’s keynote speech. 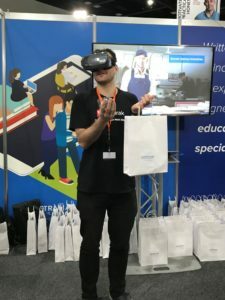 Australian Training Products demonstrated their new Immersive Video Experience, a project with the aim to deliver learning differently in an engaging and accessible way.